Did Brookings lose its integrity as a think tank when government became a $20 Million donor? 'The Case For Corruption' (2014) published by a Brookings senior fellow advocated "honest graft." contracts and grants since 2008. One of the pre-eminent D.C. think tanks is the Brookings Institution, which has nearly half-a-billion dollars in assets and deep ties to political leaders on the left. According to Brookings, it values the independence of its scholars and prides itself on "open-minded" inquiry. But, we found that rather than focusing on "open-minded" inquiry, Brookings seems swayed by "open-wallet" inquiry. In many cases, Brookings doesn't resemble a think tank, but a jukebox - add a little coin and Brookings will play your tune, if the price is right. 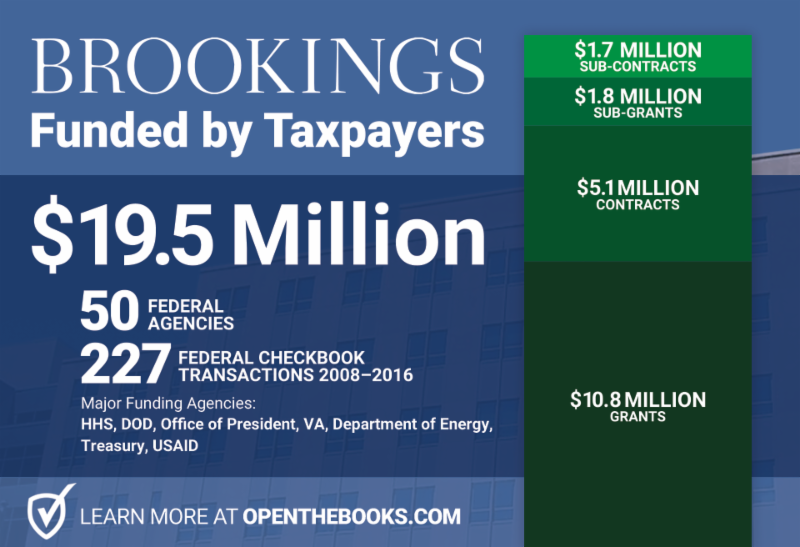 Since 2008, Brookings amassed nearly $20 million in contracts and grants from 50 agencies - including the Obama Administration's Office of the President. Brookings Senior Fellow Jonathan Rausch shockingly argued for "honest graft" in "The Case for Corruption" published by The Atlantic in 2014. We found many examples suggesting that Brookings is less of a think tank and more of a public affairs shop for establishment-left donors and allied government officials -- paid for by taxpayers. Learn about the troubling 'fellowships,' 'agency training,' 'academic journals,' and public policy projects taxpayers funded at America's foremost liberal D.C. think tank.